Alison Shaffer: Hop to It! 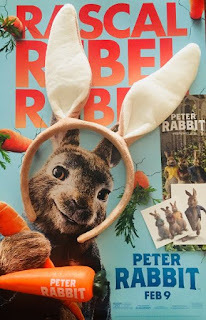 FREE tickets to see Peter Rabbit on the big screen. Hop to It! FREE tickets to see Peter Rabbit on the big screen. It's Friday and we have FREE movie passes for you to see one of my all time favorite story books, now on the big screen. 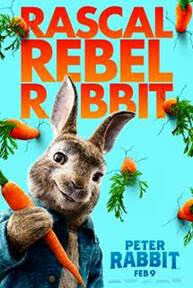 See Peter Rabbit and pals in action with more fun in and out of Mr. McGregor's garden and his house. I've always wondered why Peter gets in so much trouble since he is such a cute little bunny in the classic story books by Beatrix Potter. I guess he was just eating from Mr. McGregror's garden one too many times. Well that, and his other adventures he has to explain to his mother. Head on over to SONY and use code PeterAS to download your free movie pass. Seating for these passes is first come, first served. The pass does not guarantee you a seat. The theater will be full and after that no admission will be granted. February 3, 2018 at 10 AM. For your chance to win one of 5 pairs of Reserved Seating at this same movie screening on February 3, 2018 at 10:00 AM at King Of Prussia, Pennsylvania, please leave a comment on this blog post for chance to win. Please read the giveaway tab for terms. Peter Rabbit makes the jump from beloved storybook character to the big screen in this irreverent, contemporary comedy with attitude. Peter's feud with Mr. McGregor (Domhnall Gleason) escalates over both the vegetable treasure in McGregor's forbidden garden and their rivalry for the affections of the warm-hearted animal lover who lives next door (Rose Byrne). James Corden voices the character of Peter delivering a delightfully entertaining mix of mischief, adventurous spirit, and charm, with Margot Robbie, Elizabeth Debicki, and Daisy Ridley performing the voice roles of the triplets, Flopsy, Mopsy, and Cottontail. Disclosure: I was given information for this post in exchange for movie tickets and promotional items. The comments and views are my own.